First, I want to seize this opportunity of addressing all members of the Inter American College of Radiology in order to thank our current president Dr. Gloria Soto for trusting in me in order to take over the position of secretary general. I hope not to fall short of her expectations and I commit myself to using all my ability and determination in developing the assigned functions the best way possible. As you all know and as was presented in the assembly in Chicago, the current Board of Directors expects to develop various actions and in order to achieve them it has designed a strategic plan with three main areas of activity such as the strategic area, the educational area and the financial area. Moreover, many work groups have been created with relevant professionals from different countries that share with us hope and determination to improve the radiologic assistance in the member countries of the College. There are many tasks to develop with few resources, but I do not doubt that with great hope we can achieve them together. And on the basis of this “together” I would like to summon all College members in order to participate in these tasks. Scientific societies are comprised by their members, and these societies are what their members desire and the load of work they carry out to achieve things. The members of the Board of Directors or work groups are just one link in the chain but the individual members are who determine the future and who have the strength to lead the whole train one way or the other. It is for that reason that I request through this bulletin the cooperation and work of all in order to obtain an active and useful college for all. We are open to any suggestion regarding the topics posed in the different commissions or regarding any other topic that might concern you and that you consider the college can have influence on, solve or improve. Of all initiated projects there is one that I would like to draw your attention to and which requires your active participation. 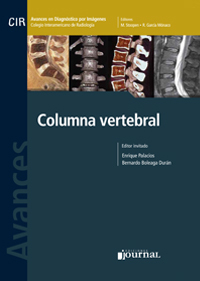 It is the project of the study group of the radiologic situation in our countries. 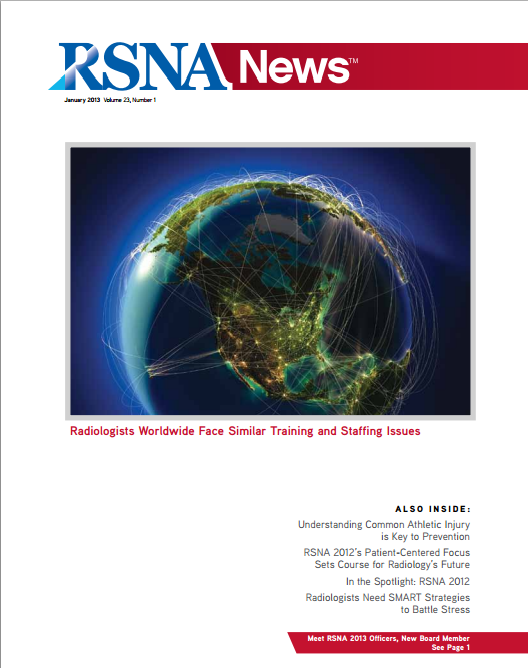 Currently, the information we have regarding the number of radiologists per country or the equipment and the degree of technological adequacy is limited and non homogeneous and we attempt to know and need to know the number of radiologists and their distribution, the number of subspecialists and the degree of insertion they have in the different countries as well as the availability and characteristics of training programmes for general radiologists and subspecialists and the characteristics of the radiologic equipment and its degree of obsolescence and technological development. As you can see, this information cannot be known without your help and collaboration. This is why in the next few months you will receive questionnaires asking for this and other information. Therefore we ask you most earnestly to provide your best input and collaboration. 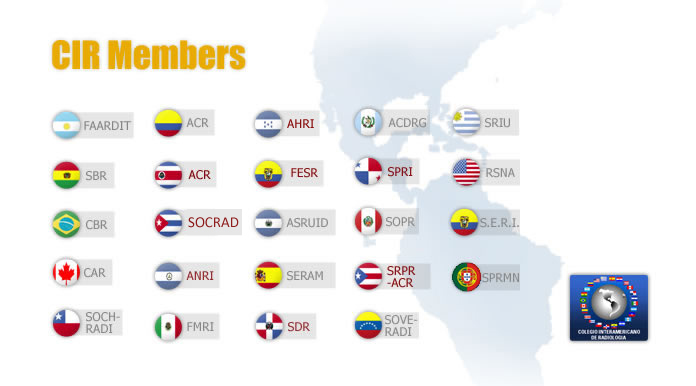 We thank you in advance for your effort and collaboration to make the Inter American College of Radiology a strong and useful scientific society for its members. In accordance with the ICR Regulation in force, radiologists who are members of the College are summoned to apply in order to be part of the body of Professors of the ICR for the period 2013-2014. Attached there is an application form which has to be completed and sent to the Secretariat of the ICR cir.admin@servimed.com.mx with a CV, which should not exceed 1 page, together with a letter of the President or Delegate of the ICR of the Society or Association of Radiology which the applicant is member of that certifies his membership, his being up to date with membership dues and his suitability to be part of the body of Professors of the ICR. The application forms received by the administration will be sent to three persons designated by the Board of Directors in order to be evaluated. Those radiologists accepted as Professors will receive their certificate by e-mail and they will be included in the catalogue of Visiting Professors in the website, being this information available to the ICR community. The due date to apply expires on April 1st, 2013. The Professor of the ICR is a radiologist who is an active member of the Radiologic Association or Society representing his/her country before the ICR. He/she is of great human quality with broad teaching experience and acknowledged professional prestige. The European Congress of Radiology of 2013, presided by Dr. José Ignacio Bilbao, who is a Spanish radiologist and member of the SERAM (Spanish Radiology Society), invited for the third time a Latin American country member of the ICR. The first one was Argentina in 2010, followed by Brazil in 2011, and Chile that will participate this year in the Programme “ESR meets...” along with Spain and South Africa. We invite all radiologists of the ICR to assist to Vienna in order to join the SERAM and the Chilean Society of Radiology in their presentations, which will take place on Saturday and Sunday from 10.30 to 12.00 in the “B” room. ESR visits Chile, clic here. ESR visits Spain, clic here. Recently published by the ESR (European Society of Radiology), along with the cooperation of the International Society for the History of Radiology (ISHRAD) and the German Röntgen Museum, a first document that covers the rich and vast heritage of our discipline has been elaborated. The ones who took the initiative for the “IDoR2012” (International Day of Radiology 2012) agreed that amongst the planned projects there should be something dedicated to the radiologic community that not only celebrates the current state of our speciality but also the 117 years of progress to honour the pioneers who brought us where we are.